A ndrew Mariadason is a Senior Solicitor in Avant Law's Melbourne office, where he has worked for the past four years. Andrew graduated from Monash University with a Bachelor of Arts and Law in 2001. Before joining Avant, he worked in general insurance, commercial litigation and personal injury law for 10 years. What has most surprised him about his work at Avant? Medical law is extremely diverse, says Andrew. "I conduct civil litigation, coronial investigations and inquests, matters before various regulators of the health profession, cases involving Medicare and other state and federal government agencies and sometimes cases involving the criminal justice system. "Most typically, the cases I deal with result from interaction between the patient and the doctor. However, there are lots of legal issues doctors are confronted with every day. For instance, I help a lot of doctors deal with Medicare when their billings are audited, which is quite removed from their interaction with their patients." 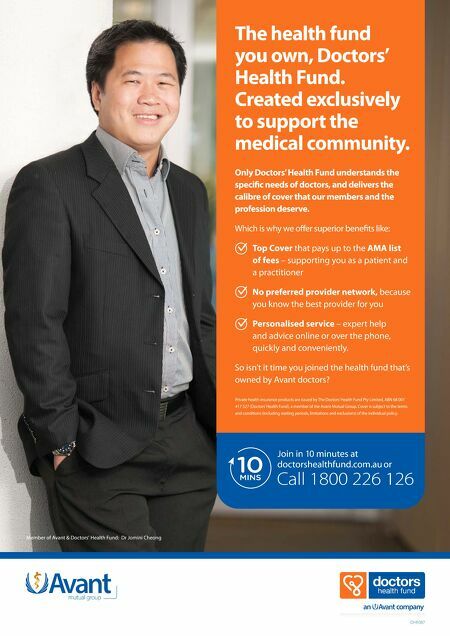 Andrew says that claims and complaints can happen to even the best of doctors. "Doctors are highly regulated. There are a number of avenues for complaint. That's a fact of life for our members." "In running a case, collaboration between disciplines is essential, given the intermingling of medical and legal issues," he says. "There is often myself, a barrister and a medical practitioner involved. "Cases can be protracted," says Andrew. "It is not unusual for legal cases to take a long time and be very involved. It's important we are responsive and available for our members over a lengthy period. Often we are analysing, in significant detail, events which sometimes occurred over a matter of hours or minutes some time ago." On other occasions, he says, the legal process can move very rapidly. For instance, the Medical Board sometimes looks to take immediate action against a practitioner. In such cases it can sometimes be a matter of days or hours between receiving instructions to act and appearing at a hearing before the Medical Board. He explains that lawyers, like doctors, need to keep good records on a case. "The importance of good clinical records can't be overstated. For lawyers, they are the best evidence of what occurred as memories do diminish over time." What about job satisfaction? "I think what doctors do is very worthwhile, and I'm driven by the notion that I'm contributing to the defence of people who are working hard to help others. Much of my day involves discussions with members," says Andrew. "I sometimes get phone calls at 9 o'clock at night. It can be a really difficult time for medical practitioners, when there's a complaint. Often doctors' reputations and even livelihoods are at risk. They need our help and expertise and we need to be there for them." His advice to members who find themselves in difficulty is to get in touch with Avant early. "Get in touch with us when you become aware, for instance, that a coroner might investigate a death, that is, well before you might be asked to give evidence at an inquest for whatever reason." "Members can come to us if they are asked to prepare an opinion or a report for the coroner. We can help them analyse the request, discuss the matter and assist them in preparing the material." And what does he do in his free time? "There's not a lot of it," admits Andrew. "With two young daughters under three, and my work, I don't have a lot spare. I enjoy cricket and football when I can." Legal life: defending members' reputations When Andrew Mariadason joined Avant Law, he expected the focus of his work would narrow. But he says it has proved quite the opposite. 20 Avant Connect Page Personal Support Program Avant provides members with personal support and counselling through our confidential Member Support Program. Call 1300 360 364 and say you're from Avant. Often doctors' reputations and even livelihoods are at risk. They need our help and expertise and we need to be there for them." "